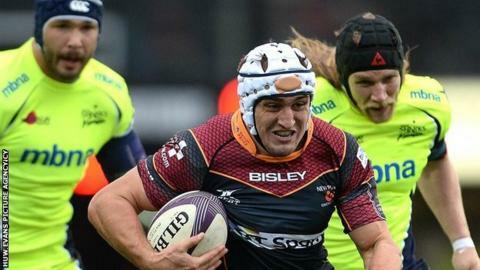 Newport Gwent Dragons secured a bonus-point win in their Challenge Cup opener after repelling a Sale Sharks comeback. The home side took a 17-0 lead into the break after tries from Ollie Griffiths, Rynard Landman and Adam Hughes, with Dorian Jones converting once. Early second-half tries from James Mitchell and Jonathan Mills brought Sale back into contention. Two Jones penalties gave Dragons breathing space and a Matthew Screech try ensured the win and a bonus point. The Dragons, struggling in the Pro12 with two wins from seven, were in ruthless mood in the first half, capitalising in full when breaching the Sale defensive line to score well constructed tries. Flanker Griffiths, tipped for a national dual contract this week, enhanced his growing reputation with a superb solo effort that started with a powerful handoff and finished with an impressive burst of pace. Sarel Pretorius created the chance with a snipping run and pass, and the scrum-half was again involved as captain Landman finished off a fine move for the second score. And a commanding half was completed when a series of drives and quick ball allowed centre Hughes to cross. There were glimpses of promise for Sale in the first half as Viliami Fihaki was held up over the tryline and Brian Mujati was denied a score for playing the ball on the floor in a ruck before driving over. The visitors, showing 13 changes to the side beaten by Harlequins in the English Premiership last week, finally broke through among the pack with tries for Micthell and Mills - the second coming when the Dragons were down to 14 after a yellow card for Phil Price. But the home side regrouped, and after Jones' second penalty gave them an 11-point lead going into the final 15 minutes, Screech stretched over to seal the victory in the shadow of the posts to claim maximum points. Newport Gwent Dragons: Meyer; Hewitt, Hughes, Warren, Scott; D Jones, Pretorius; Stankovich, Dee, Knight; Hill, Landman (capt); L Evans, Griffiths, Jackson. Replacements: Buckley, Price, Harris, Screech, Faletau, C Davies, Tovey, Wardle. Sale Sharks: Jeffers; Brady, Jennings, James, Ingall; Macleod, Mitchell; Flynn, Briggs, Mujati, Mills (capt), Ostrikov, Lund, Hughes, Fihaki. Replacements: Neild, Pope, Harrison, Nott, Beaumont, O'Donnell, Edwards.